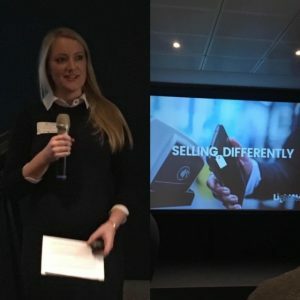 On Thursday 22nd November it was a big day for Myinternalrecruiter.com, we celebrated our first birthday and also, I spoke at Lightstarts’ incredible series of events called …differently. It really was a privilege to speak at Selling differently. Some of you may have read my previous blog on Working… differently you might be able to tell I am a fan of these events. One of the best parts of my talk was when I told everyone I had been going for a year and they all clapped. No matter how nervous I was everyone was there to champion business in Yorkshire. The other speakers were engaging, relatable and funny. I took away things from each talk to implement. Dan Akers from Lightstart spoke about his sales training in childhood and how Lightstart don’t pitch for work which is refreshing and turning the traditional methods on their head. Sally Roberts talked about the sales process and had some great practical tips for engaging with clients and closing the sale. Her knowledge on the sales process was infectious. Keely from Yboo spoke about selling to millennial’s and corporate social responsibility (which although I cant class myself as a corporate it is still important to work for a good cause) and last but not least Simon spoke about the changing careers and influencers some of the stats especially around playing with toys and slime have made me question what I am doing with my life!! I had put a lot of thought into what I would say and decided to focus on my sales journey and how I am where I am now, I felt it was important to share my background and the good, bad and ugly sales and recruitment. I know recruitment has a bad reputation, but I was there to champion the industry not slate it… in recruitment you sell twice for one sale, once to the candidate and once to the client. Then I spoke about the importance of getting a meeting at any stage of your business or relationship with your client, people are busy and don’t always care about business you have to realise you are a distraction to their day. However investing time in meeting shows commitment on both sides. The further into a relationship we get the less we feel the need to go and see people and this shouldn’t be the case. This lead on to referrals and their importance. Using Kevin Bacon as a memorable example, I challenged everyone attending to introduce people professionally without agenda and in the bar afterwards I made sure I upheld my end of the bargain. I finished my talk on motivation and how recognition and praise in sales have the biggest impact on your sales team. So can we sell differently? Yes and no. Yes, times have changed and our channels and methods are different but no in that relationships and engaging with clients are still key to any transaction.